Boston and New York are hardly unique in their vulnerability. New research in the journal Nature, based on improved dynamic modeling of the West Antarctic ice sheet, suggests that the giant sheet might collapse much more quickly than previously thought, contributing up to three feet of additional sea level rise by 2100 – for a total of up to six feet. By the mid- 2100s, sea levels could be rising about a foot a decade. This would be devastating for low-lying cities, from London to Shanghai, Venice to Miami, and especially so in developing countries such as Bangladesh with few resources and large populations already vulnerable to flooding. Traditional defenses such as sea walls would become impracticable for many areas in this scenario, and policymakers would have to start contemplating vastly expensive retreat and relocation of infrastructure and buildings. The implications for business would also be far reaching; the business response is especially important, because business not only has the financial and technological resources to address the climate challenge, but also the political clout to support – or thwart – progress. In adapting to the physical effects of a changing climate, are there some lessons to be learned from our efforts at climate mitigation (reducing emissions of greenhouse gases)? There are some similarities between climate mitigation and adaptation, but also some important differences that need to be considered if we are to tackle the adaptation challenge effectively. Some environmental groups have tried to avoid discussion of climate adaptation, for fear that it was conceding the mitigation battle to solve the climate problem at its source by reducing greenhouse gas (GHG) emissions. Adapting to the physical effects of climate change, however, is now an unavoidable reality, because our emissions trajectory has already locked in substantial climate impacts. Indeed, the immediacy and tangible costs of climate impacts may well provide a new impetus to reduce GHG emissions, as policymakers realize the huge costs of preparing coastal urban areas, which will rise steeply without more aggressive action to reduce emissions. Adaptation and mitigation should therefore be seen as complementary. As business, academics, and policymakers begin to grapple with climate adaptation, some key differences from climate mitigation are becoming clear. First, while mitigation has primarily been understood as an issue affecting the global commons, adaptation is a very local concern, where vulnerabilities are highly dependent on local geography and the urban landscape. Addressing mitigation therefore requires countries to negotiate and collaborate on emissions reductions, as seen in December at COP-21 in Paris, because our fate depends on everybody else reducing their emissions as well. Adaptation, however, does not have these positive spillover effects; New York does not directly benefit if London invests to protect itself from rising seas – though opportunities for learning do exist. At the local level, some adaptation measures, especially sea walls, can even exacerbate problems down the coast. Cities therefore have a strong incentive to invest to protect themselves, but much less reason to collaborate. Second, the key business players are different: For climate mitigation, the fossil fuel industry (and related sectors such as automobiles) saw high economic risks from climate regulation, and has historically been a strong political force against regulation, especially in the United States. For adaptation, the property sector is most vulnerable to direct physical losses, including commercial and retail businesses that occupy buildings at risk. As a result, the sector has been active in local discussions about adaptation, and generally supports publicly funded city or region wide approaches. The sector has, however, been wary of expensive private mandates to enhance building resilience, and is unclear how it might monetize the benefits of reduced risks. The insurance sector also bears considerable economic risks from exposure to physical climate-related damages, and so has an interest in enhancing resilience. Insurance rates could play an important role in shaping incentives: insurance represents the price of risk, and this price could be used to steer new construction away from vulnerable areas and to encourage investments to reinforce buildings against storm damage. The price of risk for climate adaptation is analogous to the price of carbon for climate mitigation. Yet it is a tool that offers less leverage, because insurance is a relatively small cost of doing business, compared with the role carbon prices can play in switching to cleaner energy sources. The financial sector more broadly will be taking note of these physical risks. Just as investors are growing increasingly wary of carbon intense investments, they are increasingly likely to avoid assets, from commercial property to agricultural land, that are vulnerable to climate impacts. Third, the broader business opportunities are also less clear with climate adaptation – while there will be a growing market for large construction and engineering projects, and specialized consulting services, it is hard to imagine the equivalent of the clean energy sector, which has blossomed into a $250 billion global market for solar, wind, and biofuels in 2013, and has been growing rapidly as an economic and political force. For climate mitigation, there are also substantial short-term economic benefits for organizations that invest in their own emissions reductions through energy efficiency measures such as insulation and high-efficiency lighting. For adaptation, there might be some opportunities for profitable investments in improving the resilience of facilities to flooding and wind damage, but there will also be a need for major public investment in expensive neighborhood and city level protection schemes. This raises difficult finance and governance problems, especially in the US context of fragmented authority. The clustering of clean tech activity in the Boston area creates regional competitiveness impacts and signals the strength of the regional innovation economy, which helped to motivate GE to announce the relocation of its headquarters to Boston in January. Although there is unlikely to be a parallel climate adaptation business cluster, there may well be real value in addressing climate adaptation at the regional level. In the wake of hurricane Sandy, rents fell precipitously in the New York city area, as people feared the long-term economic impact from businesses avoiding a region perceived as vulnerable to major climate-related disruption. Since then, rents have more than recovered, partly due to the ongoing economic recovery, but also, according to some observers, as a result of the comprehensive adaptation planning for the region. Adaptation planning is likely to become an important ingredient of regional economic competitiveness, at least for vulnerable areas. Less clear is how this value can be leveraged in a way that can finance the huge expenditures involved in protecting a large metropolitan region. Fourth, climate change raises important equity issues for both mitigation and adaptation. International negotiations over emissions reductions have long been bedeviled by the North-South divide, as low income countries of the global South do not want their future growth constrained by stringent GHG targets, when industrialized countries are responsible for the vast majority of historical emissions. Closer to home, workers in coal, oil, or the auto sectors do not want to bear the burden of a shift to a low-carbon economy. Climate adaptation also raises equity issues regarding the distribution of risks and costs, that are shaped by the local character of climate impacts and adaptation efforts. Some of the most vulnerable regions are in developing countries with few resources and which have contributed little to historical emissions. For example, regions in sub-Saharan Africa and the Middle East are facing the prospect of severe drought, while countries such as Bangladesh face catastrophic flooding as sea levels rise. Even in industrialized countries, communities with high proportions of low-income and minority people (and the businesses they own and frequent) are generally much more vulnerable to climate impacts – buildings might be older and less resilient to storms and floods, they are less likely to have air conditioning to protect against extreme heat, and less likely to carry adequate insurance coverage to rebuild homes and businesses after a disaster. As insurance rates rise in vulnerable areas, or coverage is cancelled altogether, poorer communities will be disproportionately affected. One of the first papers on social justice in urban climate adaptation was published in early 2016, and points to some key issues: (1) broadening participation in adaptation planning to include com­munity or social justice advocacy groups; (2) expanding adaptation efforts to rapidly growing cities and those with low financial or technical capacity – climate impacts are estimated to cost cities in the Global South more than $109 billion annually in infrastructure invest­ments alone; and (3) integrating justice into infrastructure and urban design processes – this is key, because “cities often undertake climate-change-oriented projects as strategic decisions to protect existing centers of global investment, economic growth and infrastructure expansion, and not towards broader environ­mental or social justice goals”. As the scientific evidence regarding climate change grows more dire, the political community is waking up to the urgency of the challenge. The targets set at the recent Paris COP21 climate conference require substantial decarbonization of our economy, reducing GHG emissions by around 80% by 2050, which some groups estimate might cost upwards of $1 trillion per year globally to restructure our energy, housing, and transportation infrastructure systems. The costs of climate adaptation are largely unknown for a 6 foot rise in sea level, but are likely to be at least on the same order of magnitude. Clearly, climate change is going to be a huge economic, financial, and political issue for decades to come. But it also offers a unique opportunity to recreate local economies in ways that address many of the social and economic challenges and inequalities that beset our society. If trillions of dollars need to be invested to decarbonize our economies and make our cities resilient, this investment should be guided by a transformational vision of creating sustainable, resilient, prosperous and equitable communities. This entry was posted in Business, Climate Change, Economic Development, Inequality, Sustainability and tagged climate adaptation, climate change, inequality, insurance. Bookmark the permalink. ← Africa Research: Role Model for Engaged Scholarship? It is sad that some environmental groups have had to avoid the discussion of climate adaptation because they fear that it will be interpreted as conceding the mitigation battle to solve the climate problems at its source by reducing greenhouse gas emissions. Being aware of what we will have to do in the future thanks to our lack of action in the present doesn’t mean we should stop trying. If anything it should makes us work harder to enforce climate mitigation policies. And for places that will be forced to adapt, it shouldn’t mean they will have to be alone in the battle. We should work together and help each other because in the end, we are all responsible for the climate changes that will be happening in the future. As climate change has become a rising issue in our society, we should watch how GHG emission influences the world’s environment.GHG emission makes carbon dioxide which causes global warming. Global warming is becoming worse than before, and it impacts not only on environment, but also in our lives in many ways, business and etc. It causes sea-level rising by ice melting. Place like Boston, Miami, and other place where is located in low level will have direct impact on sea-level rise. People in the world need to focus on climate change and to give efforts to reduce GHG emissions in order to prevent or slow down extremely fast rate of climate change. I’ve never heard climate migitation before I read this post. It was good to know similarities and differences between climate migitation and adaptation, which is focused on global commons and local concerns. Under different circumstances, government, policy makers, and cooperations need to use climate migitation and/or adaptation to have better solutions to make environment more sustainable. I also think that people really need to pay attention with this climate change, because without efforts from people, government, policy makers, and cooperations couldn’t solve all the issues with climate change. It’s time for pay more attention and get involved with this issue. As climate change is issued in our society, we should watch how GHG emission influences us. Every time, GHG emission makes carbon dioxide and it causes directly to the global warming system. The global warmng system is one of our important fact that people should care about. Because the gloal warming is rising issue, the ice melting is related to our society. As much as ice melts, the sea level and natural disaster is occured. The mitigation and adaption of climate change are important because it is related with economic and political issue for us. The costs and benefits about this problem will be needed people’s effort individually because it is not the only problem of government. There is the plan which name is “keeping 2 degrees”. It is concentrating to keep the level of temperature in north pole. This makes better result so that I recommand people read about the plan “2degrees guardrail”. What a wonderful and well written blog! Climate change is real and we can see the effects around us. It scares me a little to hear that our own Boston would be turned into an American Venice. I think about it and I say to myself, that will be easy to happen because Boston is a city partially built by the water. But, aren’t we all participating in the climate change? We drive cars that depend on fuel to function, and those fuel release chemicals in the air, which in turn, cause air pollution. According to many scientists, climate change will be worse. It is a fact. Rainfall will be heavier in many parts of the world, but the periods between rains will most likely grow hotter and therefore drier. The number of hurricanes and typhoons may actually fall, but the ones that do occur will draw energy from a hotter ocean surface, and therefore may be more intense, on average, than those of the past. Coastal flooding will grow more frequent and damaging. Scientists fear climate effects so severe that they might destabilize governments, produce waves of refugees, precipitate the sixth mass extinction of plants and animals in Earth’s history, and melt the polar ice caps, causing the seas to rise high enough to flood most of the world’s coastal cities (Gillis, 2015). As of October 2015, the Earth had warmed by about 1.7 degrees Fahrenheit since 1880, when records begin at a global scale. That figure includes the surface of the ocean. The warming is greater over land, and greater still in the Arctic and parts of Antarctica, added Justin Gillis. Moreover, scientists confirmed that if emissions continue unchecked, global warming could ultimately exceed 8 degrees Fahrenheit, which would transform the planet and undermine its capacity to support a large human population (Gillis, 2015). This is serious. Reducing the GHG emissions is something we all have to be committed to do. The negative consequences of not fixing this will affect each and everyone of us. I find it incredibly disappointing that political, businesses and policymakers are only interested in saving our climate because it is a cheaper approach. . Where is the concern for our climate and the GHG emissions and why haven’t we been well informed about this? As someone who cares a lot for the environment, this is upsetting to me. Companies only tend to conserve resources when they see that other companies have done so. The statement “historically been a strong political force against regulation, especially in the United States” further proves my point. Our climate matters more than the profits of businesses. Firstly, governments should improve people’s awareness of the dangers we are facing right now (climate change, sea rising). Hurricane Sandy can be the example to shown, it was not only damaged property and disrupted business, it also killed people. Secondly, increase investment in renewable energy, and promote renewable energy to build a climate-safe future. I couldn’t be more supportive of initiatives taken towards reinforcing climate regulations. It is sad to see how the key business players are not in favor of protecting the physical environments that we are living in. Although, actions taken by some environmental protection agencies could potentially result in affecting businesses economically but the planet is worth to save. It is said that: “For climate mitigation, the fossil fuel industry (and related sectors such as automobiles) saw high economic risks from climate regulation, and has historically been a strong political force against regulation, especially in the United States.” Indeed, fossil fuels companies could eventually loose trillions of dollars if ever the world decide to seriously address the matters. Therefore, environmentalists and businesses should try find a medium where both of parties can find a consensus to protect the environment while businesses can still be profitable. For many, it may be hard to be conscious of activities that will not be detrimental to the environment when there are not immediate and alarming effects occurring right before their eyes. It takes catastrophes such as hurricane Sandy to make others more aware. It may even be difficult when hearing future implications like that of sea level rising when visible effects of this will supposedly not occur for another 35 years or so. But major changes need to be made before matters worsen. As mentioned in the article, businesses must ensure that they are doing all that they can to reduce GHG. If the government begins to provide further incentives to corporations for reductions, there is a far greater chance that such efforts will be made. I strongly believe with the idea of this article. It is of utmost importance that all countries should together work on this climate change issue. These nations should also keep in mind about the future constructions. It is important to work n the present but is far more important to work on the future. There has to be realistic movement to combat climate change. Political discourse in elections and climate conference like the one in Paris won’t have an effect if the people are not aware themselves of the problem that our earth is facing. With the sea level and CO2 level is getting higher, The government has a big role And the imperative to encourage people by using environment friendly products and energy. There is always a correlation between climate mitigation and adaptation where efforts to reduce emission will help reduce the cost of adaptation for vulnerable regions. However, the cost of adaptation will dramatically increase if the level of green house gas emission keeps rising. Governments and authorities have to find a way to improve people’s awareness of the problem that our Earth is facing. To the heavy industries and auto sectors, investing a part of their huge annual profits in improving old technologies or inventing new equipment that will increase efficiency is one thing that they need to focus on. Local governments can also make policies that embrace the use of renewable energy or zero-emission vehicles. Such policies have to be able to provide enough benefits to people who buy environment-friendly products so that they will contribute to solving the problems. It is unavoidable that the cost of changing is great, but we have to sacrifice the short-term benefits in order to form a new way of running businesses that will leave the environment healthy. That is a great point Hoang. Fossil fuels companies are well aware of the climate mitigation and are even skeptical about the consequences; however, investors in these companies are simply not willing to spend a dime in buying new equipments to reduce emissions. There won’t be any change until the environmental government agencies come up with policies to tighten regulations. I happened to have the experience with Sandy in New Jersey 2013. 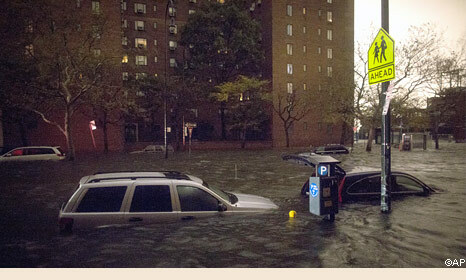 It was just one week after Sandy distorted the state. It took me two and half hours driving from New York City to New Jersey and all the gas station and convenience stores were closed. My car run in very low level of gas on the way from New Jersey to New York, and I cannot find any gas station. Sandy distorted almost all the infrastructures. That is the very first time I realized the power that nature have and people cannot take any actions toward it. Due the influence of Nino phenomenon, Shenzhen, one of the cities in China, has been snowed since 60 years ago. Climate is the elements that interact with human every second. People in entire nations should acknowledge the influence of climate changes and take actions to slow it down. Clearly, this article shows that there are ways for people to improve or prevent the change of climate, which is mitigation and adaption. However, at first, we have to overcome the challenges from political and economic problems. Most of the challenges come from the question: How can one can have benefit from applying the climate mitigation and climate adaption or how it can monetize the benefits of reduced risks? Every country and corporation wants to win the most profit for its own, therefore, it is hard to ask them inventing, changing and collaborating without the evidence of receivable benefit. The hurricane Sandy hit area along the New Jersey shore line appears to be rebuilt employing the available modern engineering and technologies which may have included climate adaptation measures to cope up with any future similar threats. However, the hardest hit area in the same shoreline was flooded with recent heavy downpours that cause damages to the same extent \. The raise of water levels due to heavy storm is an acute problem, but is a small example of what is expected to be an increase of 26 inches raise in sea levels by the year 2050, or up to 72 inches by the middle of the 22nd century. This incident, therefore, allows us to assume that all the efforts that went into rebuilding with careful planning did not prevent a subsequent onslaught, and there is more that needs to be done with respect to climate adaptation in this particular case. Obviously, Prof. Levy’s conclusion that climate adaptation and climate mitigation should go hand in hand, should be taken seriously. Apart from climate adaptation and climate mitigation, the thought of moving future important construction projects to less vulnerable areas where there is no threat from raising sea water levels could be another option. Prof. Levy indicates that the insurance industry could leverage such a move to mitigate the anticipated risk in the vulnerable ares. However, such recommendation to mitigate the risks could also come from the state and the city planners. For example, GE’s move to the sea port area of Boston which is vulnerable to raising sea water levels could have been to a better place away from this area and, yet not too far from the city. Regulating the emission of green house gas is one of many ways to prevent from raising sea level and natural disasters. But , First of all, nations have to acknowledge of the climate change, so that they can work collectively. “cities often undertake climate-change-oriented projects as strategic decisions to protect existing centers of global investment, economic growth and infrastructure expansion, and not towards broader environ­mental or social justice goals”. There is no practical way to lower the sea level. Pumping water onto Antarctica or under the Sahara have been proposed, but are not realistic nor is increasing snowfall in the Arctic or Greenland. And lowering the atmospheric CO2 level by direct air capture will likely take the remainder of the century. So while global warming can eventually be halted by a combination of emissions reduction and air capture, the sea level problem will be here for a very long time. Why has the IPCC been able to show sea levels rising by 2.3mm a year. Until 2003, even its own satellite-based evidence showed no upward trend. But suddenly the graph tilted upwards because the IPCC’s favoured experts had drawn on the finding of a single tide-gauge in Hong Kong harbour showing a 2.3mm rise. The entire global sea-level projection was then adjusted upwards by a “corrective factor” of 2.3mm, because, as the IPCC scientists admitted, they “needed to show a trend”.